Experimenting with different pizza dough recipes is how you create your masterpiece. Try our deep dish pizza recipe or our Pizza Hut dough recipe. Looking for good pizza crust recipes? You've come to the right place. Keep in mind you'll most likely try many homemade pizza crusts and techniques before you perfect your ideal crust. One thing that most of us can agree on - without a great crust, you won't have a great pizza. But how you arrive at that great crust is a subject of great debate. Should you add sugar, or not add sugar? Is it better to hand toss your dough? Tip #1: For great tasting pizza dough, make it a day or two ahead of time and keep in the refrigerator until you're ready to make your pizza. Tip #2: For great pizza crust, bake your dough on a pizza baking stone. You might also want to use a pizza peel for transferring the pizza to and from the stone and oven. Tip #3: Use tepid or warm water rather than hot water when making your dough as hot water can kill the yeast and prevent it from rising. 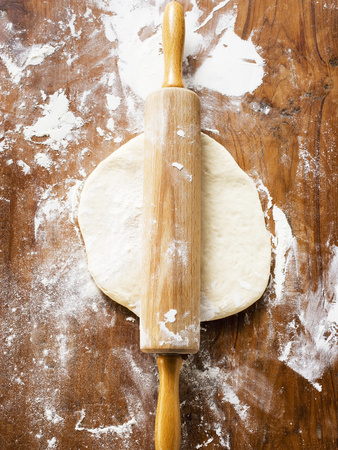 Tip #4: Leave the dough to rise in a warm place away from cool draughts. Try a warmed oven or a sunny window sill. Tip #5: After the dough has risen, you can knead in herbs for added flavor. Try some crushed garlic, fresh herbs, olive tapanade or pesto sauce. This quick and easy pizza dough recipe results in a perfectly thin crust with cracker-like crunch. It may not be the real Pizza Hut dough recipe, but it's a simple, easy substitute that can easily be made at home with a cake pan. Try this quick pizza dough recipe when you need to whip up a pie on short notice. It may not be exactly like Papa John's - but as a Papa John's lover, I found it pretty darn good. This recipe is very similar to the recipe above, but try using a different flour and see what you think! If you're looking for a healthier pizza crust, or looking for a low carb pizza, try this great pizza dough - simple like the others, but uses a whole wheat flour instead. Grilled pizza is just fabulous. Try this recipe which uses a couple different pizza flour to help it stand up to the hot flames. If you enjoy using your bread machine, then you should try this tasty dough recipe. With just a few simple ingredients and a square pan, you can have a delicious, Sicilian pizza. If you like the deep dish style of pie, then give this recipe a try. Please browse through our selection of pizza crust recipes and other crust options (ready-made) that we've compiled for you to try out. And remember to have fun with it. We are talking pizza here, not brain surgery! If, however, you really want to have a homemade pizza but want to use a pizza dough mix I have some great mixes you can use.